In my office, I have a crate in which I put recycling. Everything from frozen food meal trays to paper to plastic gets tossed into the crate. When it gets full, I bring the crate home and empty it into my recycling bin. Nice and efficient. 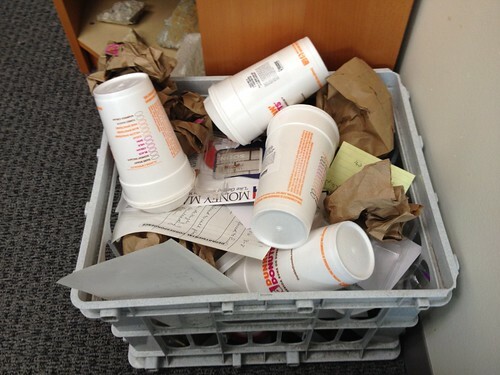 Toward the end of March, after picking up breakfast at Dunkin', I removed the tea bags and prepared to toss the styrofoam cup into the crate. There was a slight problem. The crate was full and most of it was Dunkin' styrofoam cups. I smushed these down to make room for another and, that night, took the crate home for recycling. Dunkin' is quick and easy, but not the healthiest of breakfasts. I looked at this and was kind of floored by what this represented. There were 2.5 weeks of Dunkin' cups in here. Those you can't see are under the paper and plastic miscellany added to the crate. I can't keep eating donuts for breakfast. That's not, at all, healthy. And, in reality, stuffing the money for this habit onto my Dunkin' card is not good for the budget, either. I would have to start making plans to get up in time to make myself breakfast AND have the food on hand to make that breakfast. I didn't realize how difficult this would be for me. Then, the Dunkin' I frequent made it easy. The owner of that store sold the franchise to another couple. All the people I knew in the store were let go. I walked in and the coloring contest, the balloons, the merchandise had been replaced. The people behind the counter were efficient, but they were not nearly as friendly. It was "get us in and out as quickly as possible" mode. This made cutting back, way back, on Dunkin' for breakfast, much easier. There are two Dunkin' on the way to the office. I thought I would see how friendly they were. Not any better. They are bigger stores than the one by me, but the whole tone of these places, the whole atmosphere, is one of "get people out as quickly as possible". I added more money to my Dunkin' card back at the beginning of June. Normally, I would add something every month, but I have not had to add anything in July. I don't see I will use up what's on my card before next month. I have no desire to. Part of me is sad. One of the reasons I had this habit was that I was recognized at the local Dunkin'. They took the time to get to know me, know what I liked. Yes, they did things as fast as possible, but a testament to a place is the line out the front door. Since the change in ownership, I haven't been to this place when there has been a line, even at the most popular times. I needed to cut back on my habit. It was a crutch. I didn't have to get up with any speed because I could swing by Dunkin' to get breakfast. But, this was not a healthy obsession to have. While I could afford it, my budget is better off not spending $15-$30 per month on donuts. I miss the camaraderie with the people who used to work there. A friendly, "Hello" on a morning when I stumble in at 5:45 because I have to be somewhere by 7:00, always started my day off right. It's certainly not what I experience now when I choose to go there. What's the aphorism? "The only constant is change."